Shimmer and sparkle with this New Cid Cosmetics i-glow worth £23.50. A beautiful shimmer powder that will light up even the dullest of January mornings. These marbelised glow powders are the perfect ‘pick me up’ for the skin. Using our famous baked formulation for easy, silky smooth application, i – glow has light reflective pigments for mimicking your skins natural radiance. I tried to go for something fairly universal, so plumped for the shade Sirocco which would make a beautiful highlighter on darker skintones and bring a hint of warmth to other pale-ys like me. Leave a comment to enter. Giveaway closes at 23:59GMT on 21st January. that’s absolutely beautiful, please enter me! Very pretty, not a brand I’ve ever heard of! Shiny! Would love to try it. Please enter me, looks beautiful! Please enter me, this looks so nice! Count me in! Thanks. Not trying to enter twice in same day but there was spelling mistake in email i gave earlier! Just nticed now. How shimmery! I think it would make a great highlighter! It looks so pretty! Thanks for the giveaway! Heaven knows, my pale skin could use this! This is perfect for the natural look I’ve been trying to achieve lately. I’ve been doing brights, darks, neons for so many years, time to get earthy. Oh, very pretty indeed! Thanks for entering me. Gorgeous!! Wanted to try something like this in forever! Enter me please! i smell a good highlighter there, enter me please! Boy do I need to light up my January mornings! Enter me please! Oh, beautiful! Enter me, please! Great giveaway, please enter me. Thanks! Ever since reading your blog and your love affair with blushes (well to me at least), I’m definitely more brave when it comes to experimenting. Last count, I own 4 blushes which to the old me would have been 3 blushes too many! Hehehe. That looks so pretty! Enter me, please! oh, this makes me long for spring! Beautiful colour. Please pop my name down too. What a stunning blush! I love mac msf and this looks very similar! Enter me please! thanks! Looks so pretty! Exactly what we need to chase away winter blues! ooo super pretty, glowiness in a pan…..
Aww, it looks lovely. Enter me please. i am looking for a lovely, cheerful blush-bronzer. 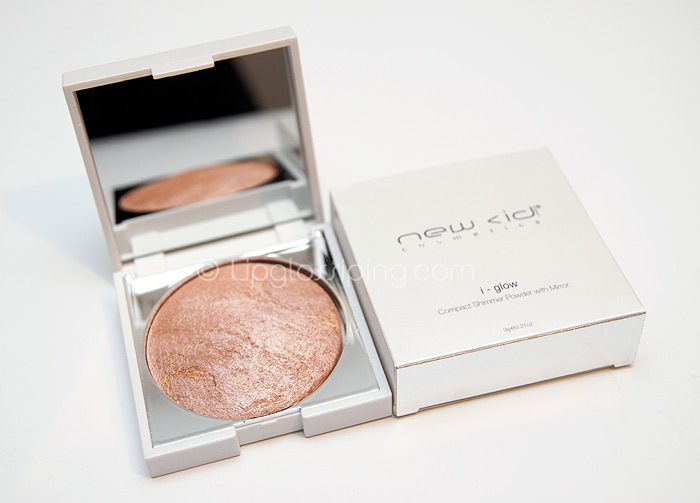 iam in love with this i-glow. I want some glow.. Thank you! this is a perfect find! Count me in! This looks like it will give a beautiful glow! I have a hard time with highlighter placement – but i’d love to have a go with this! Enter me please! so pretty.. enter me please!! Pale-y in need of warm glow, enter me please! Enter me, please! I’m still looking for a nice highlighter. Oh my looks gorgeous please count me in! I’ve never tried Cid before, enter me please! Delicious, as all your prizes and the idea of this giveaway! Thank you! I would love to try it! Love shimmery, sparkly stuff specially highlighters of all sorts! Enter me please! This looks so lovely! I hardly ever leave the home without some glow, even if i go without any foundation! Enter me!!!!! I love sparkly! Enter me please, that looks gorgeous! Such a gorgeous colour, would love to win this! Would love to win this, enter me please. Looks lovely. Loved to enter! Would love to try these out Enter me please! Enter me please, it looks so lovely! I went a whole year calling New Cid, “New Vid”. The C looks like a sideways v! Uuh that looks like a REAL shimmer powder… ! ahhhhh, preeeeettty 😀 enter me please!! I have never really heard of new cid before and am intrigued. Oh I was just Reading about this earlier & thinking that it sounds fab! omg! im such a magpie! i would love this its so sparkly and being a bridesmaid this year at an indian wedding – this would be perfect to use!!!! please enter me!!! plus im a student so probably couldnt afford to buy this!